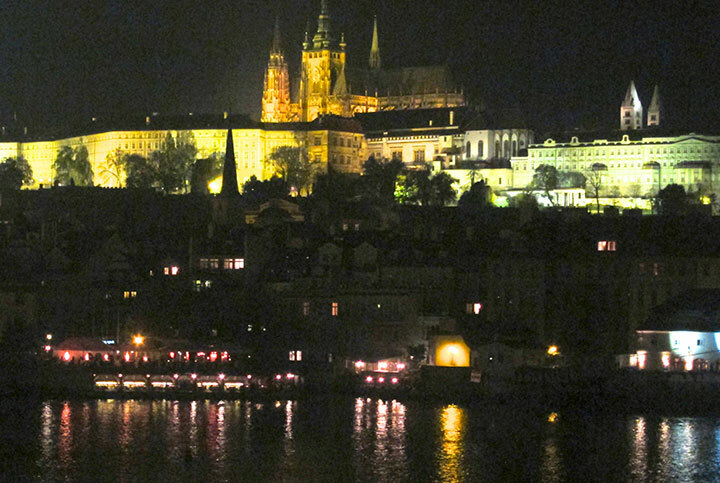 Travelling from Vienna to Prague, the classical route from the pompous capital of Austria to the charming capital of Czech Republic, a comfortable five hour train journey at almost no cost, I arrived in Prague in the evening of 4th November. 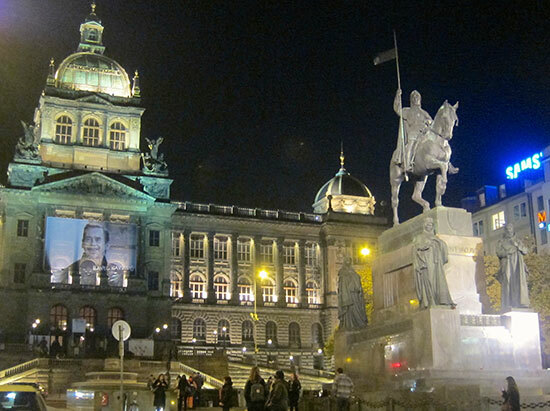 A walk through the old town, passing the Vaclav Square (photo to the right) with memories of my previous visit in 1970, two years after the Soviet invasion, checking in at my hotel, followed by a visit to the Karlovy Most (Charles Bridge) and an evening meal at a traditional Czech restaurant at Mala Strana. Next morning I was picked up by Dr. Zdeněk Štipl, researcher at the Institute of South and Central Asia, and accompanied to the institute located in historic premises of Charles University right in the middle of the old town. There we were met by Professor Jaroslav Vacek, a well-known researcher of Indology and Indian languages and till recently Head of the institute. Jaroslav Vacek and Zdeněk Štipl. The three of us then gathered for a meeting in the institute library, and I was given a brief introduction to the history of Czech Indological studies. Prof. Vacek has been working at the institute since the 1960s and has experienced the political changes strongly affecting the studies and research in his field in the country. 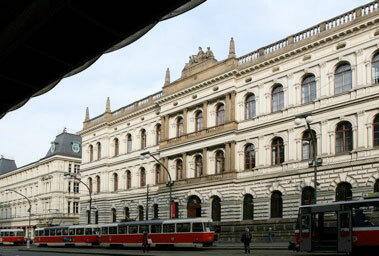 Charles University, one of the oldest in Europe, has a long tradition of classical Indology, Sanskrit taught at Charles University as part of Indo-European comparative linguistics since 1850 at the German Philosophical Faculty (August Schleicher), in 1882 a professorship started also at the new Czech Philosophical Faculty. During several decades in the 20h century, Prof. Vincenc Lesny (1882-1953), specialist in Sanskrit, Pali and Buddhism, was a key personality in making Prague an important seat of Oriental and Indian language studies in Europe, especially focusing on Bengali, Hindi and Marathi. Other researchers specialised on the study of Tamil and Sanskrit. To mention at least two from among his many pupils in Sanskrit, Kamil Zvelebil specialized in Tamil language and literature and became one of the world specialists in this field in the latter half of the 20th century. Dušan Zbavitel specialized in Bengali and besides translating extensively from Sanskrit literature, he also translated the whole work of Rabindranath Thakur into Czech. Everything changed dramatically after the Soviet invasion 1968. The most prominent professors left the country for exile and joined universities in western Europe, and repressive measures were introduced at the institute. The study of Sanskrit, Tamil and Bengali was discontinued, only Hindi remained. The focus for research shifted over to issues that were more in line with the Communist ideology of the government. However, after another 20 years the situation again changed with the 1989 velvet revolution in Czechoslovakia. The politruks were sacked from their managing positions and Prof. Jaroslav Vacek was again allowed to build up the institute to retain its former glory, highlighted in 1998 when his institute hosted the bi-annual European Conference on Modern South Asian Studies (read a conference report), coinciding with the celebration of the 650th anniversary of the Charles university. One peculiar thing with the 1968-1989 interlude was however that Prof. Vacek was given an opportunity to learn the Mongolian language, since this was a language of a friendly communist country and therefore its studies were favoured by the government. Vacek travelled frequently to Mongolia and for a long time taught Mongolian at the institute – his pupils have now taken over, among them Dr. Alena Oberfalzerova who obtained Gold Medal from the Mongolian State University for her work on Mongolian language in 2007. The Mongolian research and teaching is furthermore supported by Associate Professor J. Lubsangdorji, with whom Prof. Vacek wrote a textbook of colloquial Mongolian some years back. The textbook is used widely in teaching Mongolian to foreign students. They do extensive research in Mongolia and among Mongolian tribes in China. Their work is much appreciated both in Mongolia and abroad. Prof. Vacek still heads a project which includes Mongolian studies, linguistic and cultural, field work in Mongolia etc., besides Indian linguistics, ethnological studies etc. (and also Indonesian – Dr. Michaela Budiman at the institute teaches Indonesian and published a monograph on the Toraja funeral rituals in 2013). For his eminent research, Prof. Vacek has received several awards from the Indian and Mongolian governments (more information). The Institute of South and Central Asia at Charles University of today includes not only Indian Studies with which Vacek and Stipl are working, but also a Seminar of Mongolian and Tibetan Studies, and a Seminar of Romani Studies. Currently the institute is headed by Associate Professor Daniel Berounsky, representing the Tibetan studies part of the institute. The research work in the field of Indian studies is mostly concerned with general Linguistics, South Asian languages, literatures and rituals. One fascinating topic hat has been studied extensively is the relationship supposedly existing between Dravidian languages in South Asia and Altaic languages in central and northern Asia. This study is of course facilitated by the organisational structure of the institute. Prof. Vacek has carried out systematic research on this topic since the 1970s with a series of publications – see the bibliography of the Institute at: http://ujca.ff.cuni.cz/UJCA-214-version1-bibliografie_ujca_2012.pdf, go for section 4.3. Besides Prof. Vacek and Dr. Stipl, three other researchers are working in the Seminar of Indian studies. Dr. Martin Hribek (photo) is involved in teaching Bengali, but is also as an anthropologist engaged in research work focusing on the worship of Goddess Durga, on which he wrote his doctoral dissertation. He spends much time in Kolkata and has published several interesting articles such as one on ”Ritual use of plants in the worship of the goddess Durgá in Bengal”. (see a list of his publications). 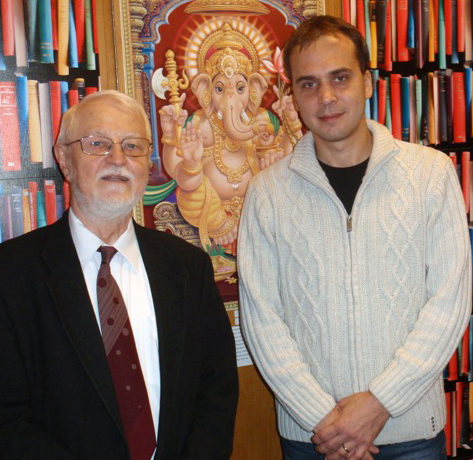 Dr. Svetislav Kostić teaches in Hindi. In June 2003, he obtained an award from the Indian Government as an appreciation of his contribution to propagation of the Hindi language. The award was granted to ten specialists from all over the world at the VIIth World Conference on the Hindi Language. Dr. Kostić obtained the award personally from the Indian Deputy Foreign Minister Mr. Digvijay Singh during his visit in the Czech Republic in September 2003. Dr. Soňa Bendíková is in charge of the teaching of Tamil language, but is also doing research focusing on Indian tribes. In 2007, she wrote for example a paper entitled ”Milk, cow and buffalo in the life of the Kotas, a tribe from the Nilgiris, South India”. It describes the function of cattle (buffalo, cow) and milk products among the tribes of the Nilgiris mountain. It includes an analysis of how milk processing passed from the Todas, former herdsmen and milkmen, to the Kotas, traditional craftsmen. The Institute is moreover engaged in the research plan Foundations of the Modern World as Reflected by Literature and Philosophy, focusing on a sub-project entitled PANDANUS. Since 2007, an international peer-reviewed journal Pandanus: Nature in Literature, Art, Myth and Ritual has been published. It specializes in Indian literatures, in addition to comparative studies involving Czech literature and other selected literatures and cultures of the world. Prof. Jaroslav Vacek is the Editor-in-chief. The Pandanus project has been turned into an International networking collaboration venture. In September 2008 four institutions, namely the Institute of South and Central Asian Studies at Charles University; the Department of Indology, Institute of Oriental Philology, Jagiellonian University in Krakow, Poland; the Department of South Asian Studies, Faculty of Oriental Studies, University of Warsaw, Poland; and the Department of Studies in Antiquity (Indological Section), State University of Milan, Italy, signed a Letter of Intent concerning further academic and research cooperation in fields of common interest. Recently, the University of Cagliari in Italy has also joined this Pandanus network, and in India a partner university is found at the University of Calicut in Kozhikode, Kerala state. The collaboration stretches beyond publishing a magazine, it also involves yearly conferences, rotating between the network members, and other forms of academic cooperation. More information about the Pandanus network. In 2010, the Institute – supported by the Indian government – held an international seminar, Indological Studies and Research: Languages, Literatures, History and Culture – Indological Identities which discussed matters relating to methodology, training and the content of the different Indological disciplines. More information. Finally, Prof. Vacek informed about the other important South Asian Studies institute in Prague. That is the Oriental Institute (OI), founded by the Jan Masaryk government in 1922 and since 1953 being run by the Academy of Sciences. The web page of the Institute – go for it – gives relevant information about the work of the Institute – I unfortunately had no time for a personal visit. In contrast with the Institute of South and Central Asia at Charles University, the Oriental Institute has no teaching, but is solely a research institute, and besides it has a much wider focus, promoting research activities on the study of culture, history, religion, literature and languages of the Arab World, Israel, India, China, and the ancient Near East. OI aims to bring together scholars and graduate/doctoral students by hosting lectures, workshops and conferences. 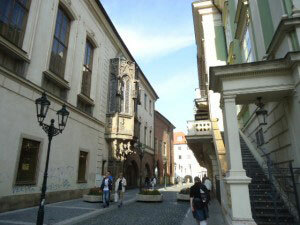 Simultaneously, members of its staff are engaged in teaching at various universities in the Czech Republic. The two institutes therefore hardly compete but are complimentary to each other. The Oriental Institute has research fellows in three departments; the Department of Middle East; the Department of South Asia; and the Department of East Asia.
. More information about the Oriental Institute. Link to Department of South Asia.